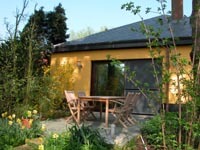 The NON SMOKING charming cottage ' T Staaksken ( 220 sqm ) is situated atop an old dike, 2 kilometers from the gastronomic village of Assenede. The village is one of the oldest villages in Flanders .The little Dutch historical town Sas van Gent with his old harbour is only 1 km away.
' 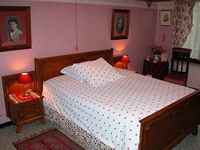 t Staaksken has furniture in the Flemish style and sleeps up to four guests in one single and 2 double rooms. 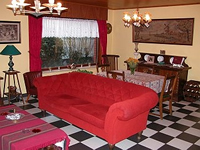 Sitting- and dinningroom with Flemish style furniture with TV - video - DVD and library. From the sitting room / terrace a panoramic view encompasses the garden, pond and surrounding fields and pasture land. There is a nature garden from 2.500 sqm with pond and various south facing sun terraces. Private creek on 2 km from the house ( free fishing) At the house, free bicycles are provided for guests. We don't accept children younger than 12 years old. The willow-lined canals, lush green pastures and extensive soft, sandy dunes of Flanders need no introduction; their beauty has been captured for centuries by some of the world's greatest artists. The Meetjesland, however is known only to a discerning few, yet it has much to offer anyone seeking peace and quiet. Its one of those rare corners of Western Europe where time has virtually stood still and man has barely changed the face of nature. Today its a land of creeks and polders, tall fields, « sleeping » dikes and old smugglers routes in the north and woodlands in the south which contain beautiful castles and castle farms. The region is ideal for cycling, walking, relaxing and fishing and of course to discover the historical towns of Ghent, Hulst, Bruges, Antwerp, Damme, Middelburg, Brussels. The Dutch North-sea Coast of Breskens, Knokke and Vlissingen is a 30 minute drive. Activities in the Assenede area include tennis - bowling - golf - sailing - surfing - tropical in- and outdoor swimming-pool - fishing - bicycling - hiking - kayak - etc.